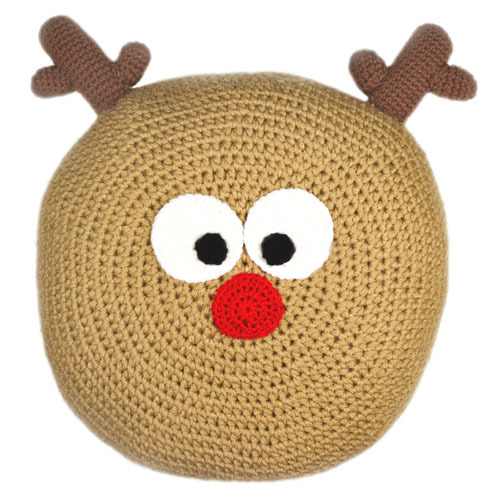 Add this adorable reindeer pillow to your home decoration this holiday season, or give it as a Christmas gift to someone you know who would love it. This round toss pillow is sure to impress! The pillow is crocheted in the round from the center out using 2 strands of yarn held together for a sturdy and quick finish. Then the eyes, nose, and antlers are sewn on. This entry was posted on Monday, November 13th, 2017 at 12:00 AM by Rachel Choi	and is filed under Best Crochet Patterns. You can follow any responses to this entry through the RSS 2.0 feed. You can skip to the end and leave a response. Pinging is currently not allowed.